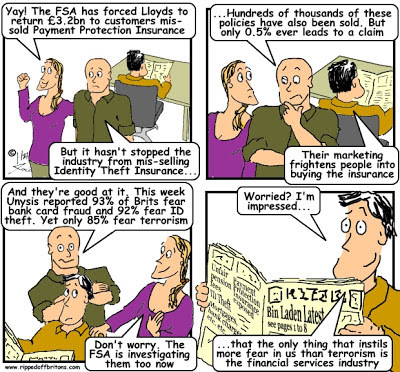 The FSA's largest retail fine for scandalous mis-selling. The real scandal is the fine is so small compared to the scam. If you fine someone far less money than what they made from the scam in the first place, you are giving them a clear signal to do it again. Here is a typical example. The FSA imposed a "record fine" on CPP, who describe themselves as a provider of "Life Assistance products designed to make life less stressful". A penalty that CPP has accepted. The greatest scandal is not what CPP got up to, but the FSA's performance in this debacle. What CPP did is typical of what financial services companies do: mis-sell (PPI; Mortgage Endowments; Personal Pensions; Interest Rate Swaps...). Don't blame a dog that is trained to bite when it does bite - blame the trainer. The FSA has been training the financial industry for years that the penalties of biting their customers will be a tiny fraction of their profits. CPP is just the latest case in point, showing that even in the final months before the FSA is closed and replaced in 2013 it is determined to live down to its abysmal reputation. 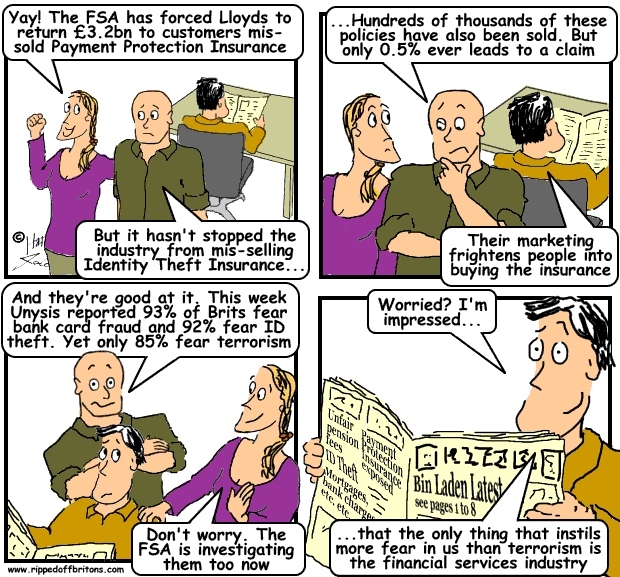 We sincerely hope that the FSA is being closed, though rather fear it is being cloned into its 'replacement' the spookily similarly named Financial Conduct Authority (FCA). After all, financial companies are among the most generous donors to political parties, and the most extravagant lobbyists (£92 million was spent by finance industry on lobbying in 2011). The FSA’s “record fine” imposed on CPP exposes a number of nasty facts. None nastier than the fact that the total stated penalty was less than 3% of the money taken by CPP selling the products in question. All the following facts are extracted from the FSA’s judgement. The two products CPP was punished for were Card Protection and Identity Protection. Each was sold as insuring you against the costs of fraudulent use of your card or your identity. CPP generated gross profits of £354.5 million and net profits of £79.1 million. A £10.5 million fine, and £14.5 million compensation bill? But CPP took £844.8 million in customer payments. The FSA punishment was just over 1% of sales, and compensation amounted to less than 2% of sales. i.e. for the £35 paid by a customer for card protection, the actual insurance premium cost 60 pence - that's less than 2p in the pound of the original payment. The rest of the money, £34.40 out of £35, was pocketed by CPP and the business partners who introduced the customers. CPP were presumably happy to hand 60% of the money to its business partners because this was essentially 'free money' for CPP. CPP's job was just to collect it. i.e. for the £84 paid by a customer for card protection, the actual insurance premium cost £16. The rest of the money was pocketed by CPP and its business partners. Pre-notification cover provided customers with up to £5,000 of insurance for unauthorised transactions which occurred before they notified CPP that their cards were lost or stolen. However, cardholders are not liable for more than the first £50 if the transaction falls within the Consumer Credit Act 1974 (which is very often the case and so this aspect of cover was of very limited value). Further, for transactions that are not covered by that legislation, the customer is only liable for more than the first £50 if they have been “grossly negligent”. The post-notification feature purported to provide customers with up to £50,000 or £100,000 of insurance (the figure varied over the Relevant Period) for unauthorised transactions which occurred after customers notified CPP that their cards had been lost or stolen. However, cardholders are not liable for unauthorised transactions after they notify their card issuers that their cards have been lost or stolen. “CPP continued to approach its sales pitches in this way despite being alerted to the problem by the FSA on 5 June 2008”. but failed to explain that the insurance only covers administrative and legal expenses. They did not explain that the insurance does not cover debts fraudulently taken out in the individual’s name (although the customer is not liable for such debts in any event). In response to a customer’s objection that identity theft will “never happen to me” the sales agent was told to respond, “APACS state 1 out of 5 of us will be a victim of ID crime by the end of the year”. The UK Payments Administration website, which holds the APACS information, did not contain information to support this statement for identity theft in 2008 and the statistic itself is not supported by any reputable statistics. CIFAS’ website indicated a 1% increase in identity theft cases between 2009 and 2010. The sales agent told customers that they were legally liable to repay debts fraudulently taken out in their names when this was not true. With fibs like this being read off a script, presumably the vast bulk of policies were mis-sold. And yet the FSA has accepted CPP's intention to pay back 17 pence out of every pound they took (compensation = £14.5 million, total takings = £844.8 million). “In some instances, as explained further below, customers never received the [notification of renewal] letter because CPP failed to keep an up-to-date customer address list. In those cases, the customer was unlikely to become aware that CPP had renewed his policy unless he reviewed the credit or debit card statement that captured that payment. once the cancellation window closed, a customer was required to pay for the whole year and it was not possible to receive even a partial refund. 5) The ruthless way the big banks were sending their customers to CPP like lambs to the slaughter. For which the banks were getting up to 60% of the customer’s money as commission. “The majority of its sales were “introduced sales”, sales which occurred when a business partner introduced its customer to CPP to give CPP the opportunity to sell Card Protection and Identity Protection. CPP paid relevant business partners a commission for each original sale and a further commission each time the customer renewed his policy. i.e. what the customer thought was a call to confirm safe receipt was actually a sales cold-call. Worse than a normal cold-call, the customer did the dialling and paid for the call! CPP may not be the same magnitude as the Payment Protection Insurance (PPI) scandal, which is costing the banks around £15 billion. However it does provide further evidence that PPI was not an aberration - just part of business as usual in the Financial Services industry. It also shows that the FSA continuous to be the pusillanimous poodle it never ceased to be. Financial Conduct Authority fines Credit Suisse International and Yorshire Building Society a totl £3.7million for mis-selling to 83,777 customers who invested a total of £797million. "The Financial Conduct Authority (FCA) has today fined both Credit Suisse International (CSI) and Yorkshire Building Society (YBS) for failing to ensure financial promotions for CSI’s Cliquet Product1 were clear, fair and not misleading. CSI was fined £2,398,100 and YBS’s fine was £1,429,000. " "The probability of achieving only the minimum return was 40-50% and the probability of achieving the maximum return was close to 0%. Despite this CSI’s and YBS’s financial promotions marketed the potential maximum return on the product as a key promotional feature." "The target market for the Cliquet Product was described by CSI as "stepping stone customers" who were conservative and risk averse. The product was typically sold to unsophisticated investors with limited investment experience and knowledge through a number of distributors. 83,777 customers invested a total of £797,380,716 in the product; with YBS being the distributor responsible for approximately 75% of the total amount invested."